Plot Summary: The Shocker Organization sends two of its cyborg freaks to destroy an atomic plant, but their plan is foiled by an invisible barrier that surrounds the complex. Because of this, they abduct a top soccer player and convert him into a lizard kaijin capable of kicking a 5 kg bomb to destroy the plant's barrier. 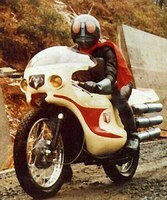 Kamen Rider must once again combat the Shocker and prevent them from destroying the atomic plant. Theatrical version of episode 13 of the series.